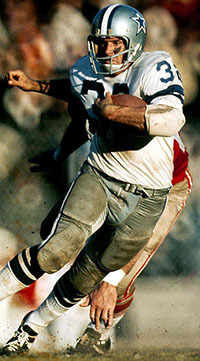 Walt Garrison, Dallas Cowboys fullback when asked if Tom Landry ever smiles: "I don't know. I only played there for nine years." The Tigers' concentration was disrupted by the imminent loss of their coach. The 49ers owner really didn't like losing in New Orleans. 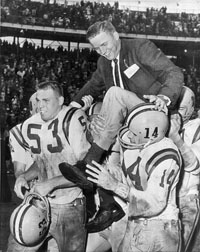 Bill Peterson's 1967 Noles scored as many points on Bama in the opener as the Tide had allowed the entire '66 season. 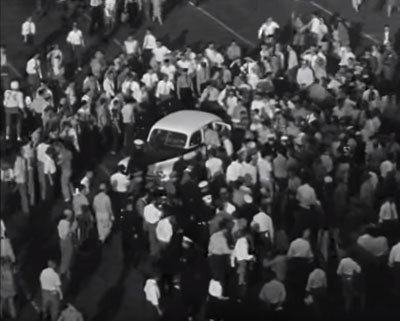 The officials had to be whisked away in a police car when the tumultuous game ended. Intentional grounding as time expires in a tie game. Which item doesn't belong in the category? In the opening game of the 1941 season between UCLA and Washington, six members of a Southern Cal fraternity furtively joined the Bruin rooters. After the game they helped UCLA students load their Victory Bell into a truck for the trip back to the Westwood campus. One of the Southern Cal students stole the truck keys. And while the UCLA students went for another set, the Trojans drove off with the truck and the bell. 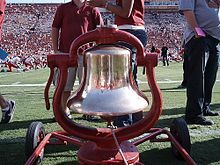 The theft of the 295-pound locomotive clanger and the subsequent search made the bell a fighting symbol between Southern Cal and UCLA. For more than a year it was hidden, first in the Hollywood Hills and then in a Santa Ana haystack. The police were called in on the search, but were just as unlucky as UCLA students in finding the object. After a series of cross-town raids, the student body presidents of both schools met to negotiate an end to the search. Southern Cal agreed to return the bell - on the condition that it would be a permanent game trophy. The next year Southern Cal lost it back to UCLA. Beaten for the first time by the Bruins, 14-7, the Trojans came to a stark realization that the city of Los Angeles no longer belonged to them. Forever the king of southern California, the Trojans now reigned with another. The Victory Bell caper symbolized this new co-existence. And compared to other tom-foolery between UCLA and USC students, it was relatively tame. Starting in the 1940s, Southern Cal-UCLA games transcended the football field and split the city of Los Angeles in half. UCLA was a football power on the rise, and Southern Cal was coming back down to earth after the Howard Jones years. The fierceness of this rivalry was mirrored in campus pranks. The week after the football teams played to a 7-7 tie in 1941, a vicious scrimmage took place between students of UCLA and Southern Cal. When four Southern Cal students took the locomotive bell over to the UCLA campus, they were pulled from their truck, dragged before the student body, and had their heads shaven. Later a large procession of UCLA students, who had attended a victory rally on the Westwood campus, drove their honking cars to a downtown Los Angeles intersection and blocked traffic for hours with varied stunts. Accompanying them was the school band. Later in the day Southern Cal students got even for the UCLA indignities. When 20 carloads of UCLA students invaded the Trojan campus with the taunt, "Rose Bowl, here we come! Ex-Trojans, we're sorry for you!" they paid for it. Irate Southern Cal students dragged their UCLA counterparts through a series of humiliations. They shaved their heads and painted "SC" on their skulls. They forced them to clean blue paint off the Tommy Trojan statue. (UCLA students had previously painted the Trojan symbol with the Bruins' color.) And they dumped them into a fish pond with the chant, "Fish Bowl, here we come!" UCLA females were treated with disdain, although not as harshly molested as the males. They had their heads dunked. "Automobile spark plugs were pulled, motor hoods were ripped off, tires were deflated, and a jeep was pushed squarely in the middle of the fish pond," a newspaper reported. Limping past police riot cards UCLA students promised: "We'll be back tomorrow - wait." Since the raucous 1941 scene, this special rivalry reached innovative heights. Head-shaving was cut out after a while, giving way to sophistication. In later years mice were released in the UCLA library, a bomb went off in the UCLA rooting section, and the Trojan horse, Traveler, was painted blue. Tommy Trojan, the proud symbol of Southern Cal athletics, was an obvious victim. UCLA students painted him, dropped fertilizer on his nose from a helicopter, and welded his own sword into his back. Campus frenzy became icily scientific when it pertained to Southern Cal and UCLA. 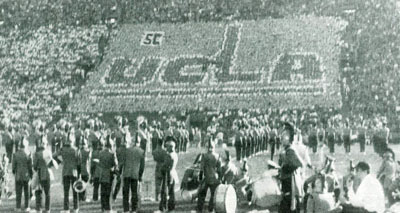 Southern Cal "spies" infiltrated UCLA one season and schemed to disrupt the Bruins' card stunts at football games. A red-and-gold "SC" appeared in one corner of each card stunt picture, much to the puzzlement of UCLA students. Another time, Southern Cal students pulled off an imaginative electronic job. "How they did it, I don't know," says Athletic Support Groups director Nick Pappas. "But they somehow got into the classroom speaker system at UCLA. These guys wired into several of the buildings. Then, every 15 minutes or so, they'd play tapes of the Southern Cal fight song. At intervals, "Fight On For Old SC" would blare through the UCLA campus. Oh, it just drove them crazy." Dan Berger, a sportswriter for the Associated Press in Los Angeles, remembers another devious Southern Cal plot. "The shop that printed the Daily Bruin at UCLA was invaded, stories were stolen and rewritten, pictures and captions were changed, and a bogus edition was printed by Southern Cal students. 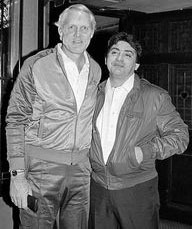 Then the Trojan pranksters kidnapped the truck driver who delivered the UCLA papers and replaced the genuine with the phonies. When UCLA students opened their daily paper the next day, they read the team's star QB saying, 'I'd feel much better about our chances against those terrific Trojans if we had a couple of players who understood the game.' 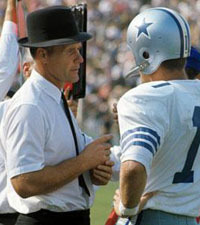 The coach added, 'I can't see any hope for our team.'"